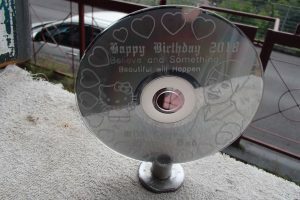 This year, I am going to engrave a birthday greeting for my daughter on a CD. 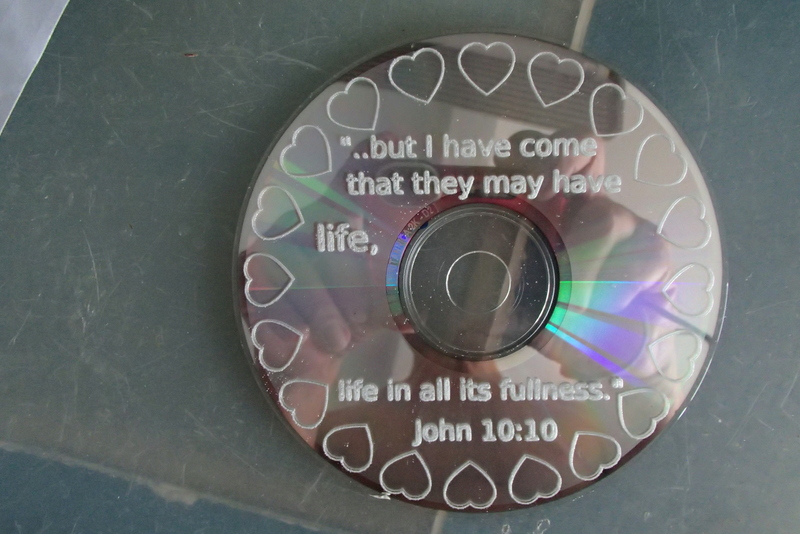 At this moment, I am experimenting with engraving on CD and I am very keen on letting people become aware of the verses in the Holy Bible – “For the word of God is living and effective, sharper than any two-edged sword. It pierces to the division of soul and spirit, of joints and marrow, and judges the intentions and thoughts of the heart.” – Hebrews 4,12 – so that they too can experience the joy and peace that comes with being accepted as a child of God. 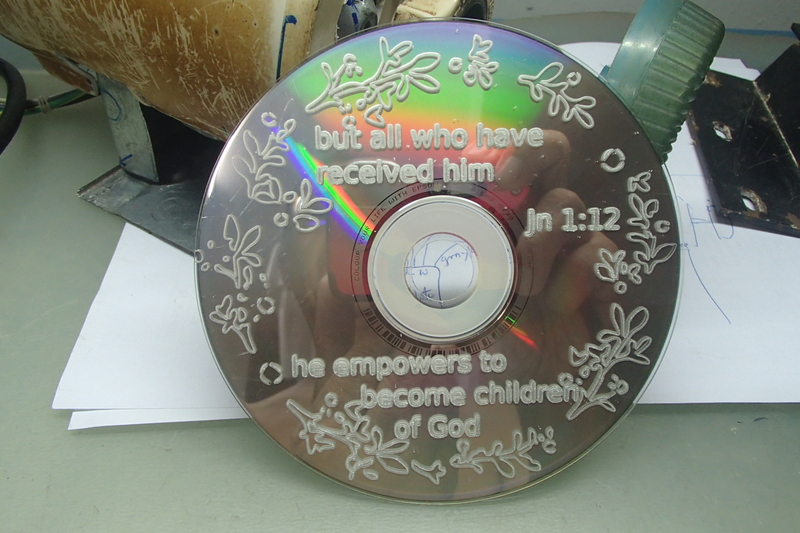 Previous attempts at engraving CD’s had produced mixed results. Sometimes, the cuts would not show at some places – which could be attributed to them not being level. Or it could also be because they were being clamped unevenly so that some portions become lower than the rest. Or it could be because some places were too flexible such that they would flex and not be cut when pressed by the cutting tool. 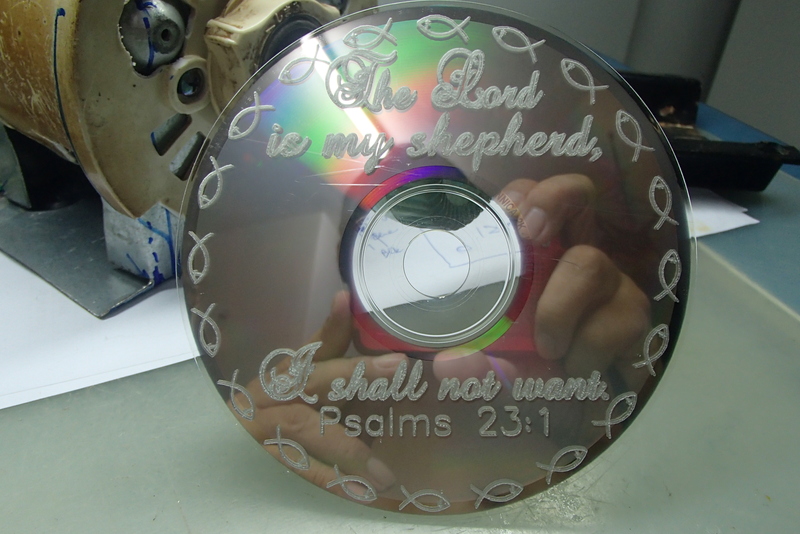 The Lord is my shepherd, I shall not want – Psalms 23:1 engraved using Precious font. Attaching the work piece to the movable bed of the cnc machine was also important. I wanted the method to be cheap and easy to do. I have tried clamping and using double sided tape. Despite resurfacing of my cnc table, all these methods gave unpredictable results. Sometimes the results would be good, while other times, there would be some faults in the engraving. Then I saw a youtube video of a method which was cheap and could produce consistent results. It used a combination of masking tapes and super glue. While experimenting with this method, I also discovered that the CD that I used were too flexible. If it was not supported at any spot, it tended to produce only faint engravings or none at all. So after making this discovery, I made sure that the work piece CD was supported at almost the entire engraving space. Because the masking tape was wide – about 50 mm – it was possible to cover the entire disc using 3 rows. I don’t think this would be possible with double sided tapes. The adhesive of the masking tape was strong enough to not allow the work piece CD to move during the engraving process. 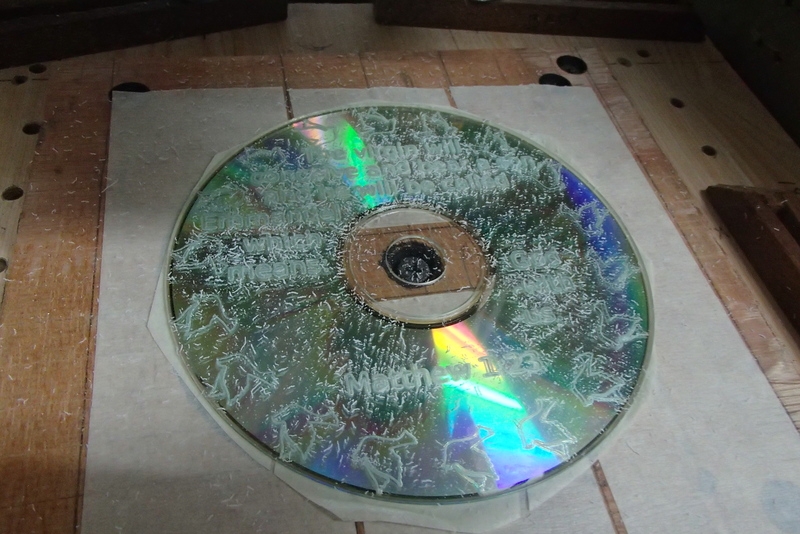 At the same time, it was weak enough to allow me to peel the masking tape from the cnc machine table and also from the CD itself. I have tried using double-sided tapes before. Usually they would be more expensive. On top of that, some of the adhesives used in the cheaper ones tend not to be strong enough to hold the work piece in place during engraving, while heavy duty ones (more expensive ones) tend to have the adhesives too strong, so much so that some pieces of foam rubber material sometimes remain stuck in place while I was trying to remove them. With this method of securing the CD on the table, I am confident that I could produce consistently good results. I have started to create borders for the Bible verses and I think they look quite pretty. The birthday greeting CD that I engrave, contained many features contained in Inkscape software – border with different sized heart objects, graphic of Hello Kitty cartoon, graphic outline of my daughter, single-lined Hershey Gothic English text, single-lined Sans 1-stroke text. I had wanted to create a TSP engraving image of my daughter from a photograph, but the engraving did not turn out nice, so I scrapped it. With practice, I think I could produce beautiful works of art.